The Maitland Mustangs handed the Norths Bears their first loss of the season, 72-71. Following a slow start, the Mustangs completed their comeback courtesy of a 47-37 second half. Terell Turner was Maitland’s high scorer, tallying 23 points and shooting 67% from three on six shots. Bears’ Anatoly Bose had a strong afternoon, dropping 25 points, 13 rebounds and three assists. The Bankstown Bruins barely edged out the Penrith Panthers, 74-73. Penrith may just have beaten themselves, they had 7 more assists than Bankstown, 15 more rebounds, but had a total of 27 turnovers. 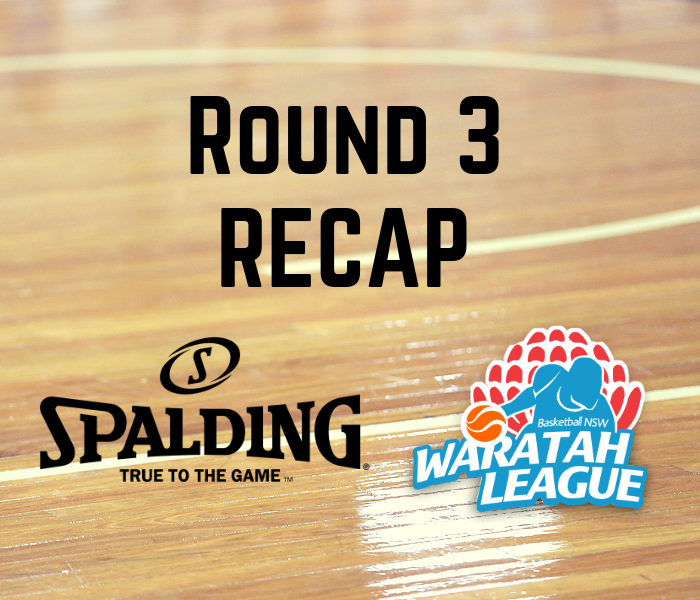 Both teams had a trio of double-digit scorers: for Penrith Lochlan Charlton, Viliami Foketi, and Benjamin Kearins had 10, 16, and 19 points respectively. Kearins also added 9 assists while leading the division in assists per game. For this Bankstown side, Mark Franco and Jack Lopez both had 14 points, while Alexander Foster scored 15. The Hornsby Ku Ring Gai Spiders defeated the Norths Bears, 83-80, in one of the best games of the weekend. Spiders’ Rachel Maenpaa led her team to victory, collecting 27 points, 14 rebounds and five assists. Several Spiders supplied a strong team effort: Madeleine O’Hehir’s all-around game contributed seven points, 10 rebounds, and five assists, while Sarah Graham added 14 points, including three three-pointers, four rebounds, four assists, and two steals. Elle Carroll was the leading Norths scorer with 22 points, while Elizajane Loader and Emily Simons both contributed 10. The Sutherland Sharks stay undefeated after defeating the Central Coast Crusaders, 77-37. The dynamic duo of Shyla Heal and Maddie Norris combined for 50 points and 29 total rebounds, while Heal dropped a triple-double with 26 points, 13 rebounds, and 10 assists. Sutherland dominated the statistical categories, they added up 22 assists while grabbing 51 rebounds. The Illawarra Hawks beat the Bankstown Bruins, 87-84. A balanced attack from both teams highlighted a competitive match. Five Hawks were in double figures, Jake Newham, Jarrod Sorenson, Sean Mullan, Andrew Gray, and Scott Hunter had 11, 14, 15, 16, and 18 points respectively. Four Bankstown scorers reached over ten, Andre Boykin, Jimmy Kien, Fletcher Mullen, and Svetomir Gavrilovic had 11, 12, 17, and 20 points respectively. Three high scorers helped the Sutherland Sharks outlast the Lithgow Lazers in a high-scoring affair, 109-97. Jason Freshwater, Reece Craigie, and Bailey Musulin had 30, 29, and 25 respectively. Lazers Michael Johnson and Drelan Tripplett fought off the opposition with 24 and 23 points of their own, but ultimately fell short. The Dubbo Rams came out of the gates strong, picking up their first win of the competition against the Camden Valley Wildfire, 71-51. Faatimah Amen-Ra fought off the Wildfire in a 34 point performance including four three-pointers. Camden Valley’s Tomilayo Akinpetide and Racquel Villavicencio had 18 and 17 points respectively. The Queanbeyan Yowies beat the Wagga Wagga Blaze, 94-84. The Yowies displayed a competent team effort; Tegan Ketels, Julie Ticehurst, Sophie Anderson, and Emma Rowcliffe had 12, 15, 17, and 20 points respectively. The Blacktown Storm picked up their third win against the Shoalhaven Tigers, 85-73. Hayden Blankley continued a strong 2019 season for his undefeated Storm, scoring 26 points. Riley O’Shannessy and Lachlan Armstrong fought back with tough 20-point efforts but ultimately fell short. The Sydney Comets also chalked up their third tally in the win column, defeating the Newcastle Hunters, 80-77. Comets’ Matur Malluach scored his season high with 27 points, backed up by his teammate Askam Reed Nottage’s 16. Jakob Dorricott dropped 18 points for his Hunters in the loss. The Hornsby Ku Ring Gai Spiders picked up their second win of the season against the Norths Bears in a nailbiter, 76-75. This game featured a clash of two dynamic scorers. League leader in points per game Kira Mocatta led the way for her Spiders with 16 points, rivaled by Norths’ Elle Caroll, who leads the league in match points, had 29 in the loss. The St George Saints outshined the Coffs Harbour Suns, 71-68. Three Saints reached double figures, with Michael Urbaniak and Dimitri Georgopoulos each scoring 11 points and Jesse Grant tallying 12 points. The game’s highest scorer was Samuel Schellenberger, who had 17 points.